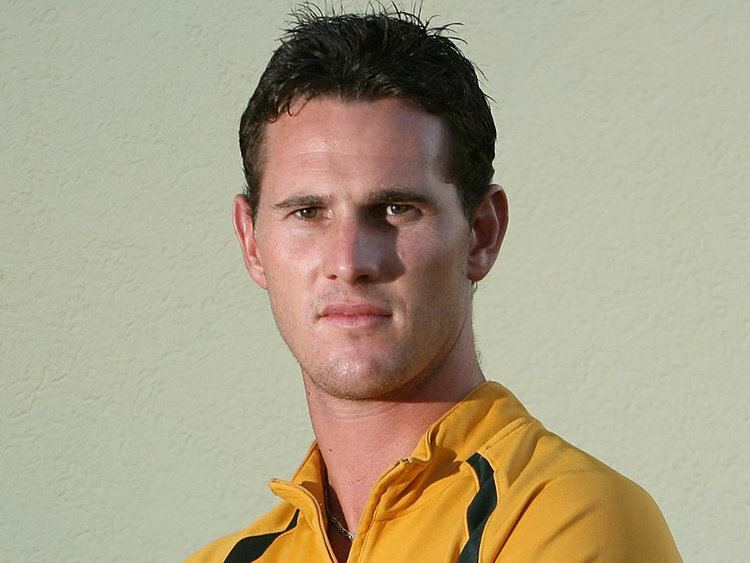 Shaun William Tait (born 22 February 1983 in Nairne, Adelaide, South Australia) is a professional Australian cricketer, who currently plays only in the Twenty20 format. Tait plays domestic cricket for South Australia and is also a representative for Australia at Twenty20 International level; he has also represented his country in One Day Internationals and test matches. He is a right arm fast bowler. Tait retired from One Day International cricket on 28 March 2011, following Australias early exit from the 2011 Cricket World Cup. Taits delivery action is a sling style that is reminiscent of former Australian fast bowler Jeff Thomsons action. Dubbed "The Wild Thing", Tait is considered one of the fastest bowlers in the world and regularly delivers the ball at speeds up to 155 km/h, and occasionally faster. At T20 international on 5 February 2010 against Pakistan Tait bowled a ball measured at 160.7 km/h, the fastest ball ever recorded in Australia. His fastest ball was against England at Lords at 161.1kph (100.1 mph) in 2010, which is second fastest all time behind Shoaib Akhtar and fastest amongst active bowlers as of 3 January 2015. Despite his speed, Tait has often been described as "erratic" and is capable of bowling many extras, though his unpredictability can be a positive factor in dismissing batsmen and his strike rate confirms this. Tait has also been criticised as "expensive." Tait has represented South Australia for a majority of his first-class career, however has also played matches for Australia A and Durham. He has taken over 150 first-class wickets at a strike rate of under 50. At the age of nineteen, Tait made his first-class debut for South Australia against Western Australia on 19 December 2002 at the Adelaide Oval. He only bowled in one innings on his debut, yet finished with respectable figures of 3/77 off 22.2 overs. Tait played 5 games in his first season, taking 20 wickets at an average of 22.55. As a result of his strong first season, Tait was awarded with a place at the Australian Cricket Academy alongside such players as Ben Hilfenhaus and Luke Ronchi. Tait made his List A debut on 1 February 2003 for South Australia against Western Australia. South Australia lost the match and Tait failed to take a wicket, however he was economical in his 7 overs, taking 0/29. While he only played one more List A match in the 2002–03 season, Tait was an important fixture for South Australia in the 2003–04 season. Tait was South Australias leading wicket taker, and the second leading wicket taker overall in the 2003–04 ING Cup with 18 wickets at an average of 19.61. The highlight of the season for Tait was undoubtedly his record breaking haul of 8/43 against Tasmania on 9 January 2004. These were the best ever figures by an Australian in List A cricket, and the eighth best List A figures of all time. In the same season Tait played a One Day match for the Prime Ministers XI against the touring Indians in a team captained by Steve Waugh and was also a part of the Australia A team that took on Zimbabwe in January 2004. 2004–05 saw Tait lead the wicket-taking list in the ING Cup as he took 21 wickets at an average of 19.90, and in 2005–06 his 14 wickets at 13.28 assisted South Australia in reaching the final. Despite the Redbacks losing the final by 1 wicket, Tait provided an excellent performance after his team posted a relatively small target of 154, claiming 6/41 off 10 overs. Tait was named in Australias Test squad to tour Sri Lanka in 2004 as a replacement for the injured Brett Lee. Tait did not play a Test on the tour, however after an impressive domestic summer, in April 2005 Tait was named in Australias squad to tour England for the 2005 Ashes series. Tait made his Test debut against England on 25 August 2005 at Trent Bridge. Some suggested that Tait should have played in the first Test of the series, but an injury to Glenn McGrath and the poor form of Jason Gillespie gave Tait his chance. Tait bowled 24 overs and took 3/97 in his first innings, the best figures of any Australian fast bowler in the match. Taits first Test wicket was that of Marcus Trescothick. He also picked up the scalps of England all-rounder Andrew Flintoff and batsman Ian Bell. While Tait went wicketless in the second innings, he held his spot to play in the final Test of the Ashes series at The Oval, taking 1/61 in the first innings and 1/28 in the second. In August 2013, Shaun Tait became engaged to Indian swimsuit model and wine entrepreneur Mashoom Singha, the sister of Shamita Singha who was Femina Miss Earth India 2001. On 12 June 2014, they got married in Mumbai.